With an upcoming tournament I had been prepping, modifying, tinkering and organizing gear for at least a month though it felt like longer. Of course, Mother Nature decided she would unleash Big Bad Wolf style on Texas that Saturday. The tournament directors rightly chose to postpone the tourney to a later named date. 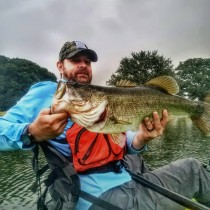 I had already planned to drive up to the Dallas area to stay with my brother so I activated Plan B.
I called him and we made a plan to fish a south shoreline, somewhat sheltered from the wind, at a local lake. I would load up, follow the same travel schedule, fish and then return home. No big deal. I'm flexible. Fast forward to a few hours later. I was attempting to load the kayaks on top of my SUV and the Big Bad Wolf made her presence known. I loaded the Coosa and strapped her down which wasn't too bad. Lifting a 70 pound kayak over your head in the wind is never fun but it went fine. The next task was to load a Cobra Tandem on top of the Coosa and strap them both down. I have done this before but never in the wind and especially not in 30+ mph wind. Four times I got the Cobra up and almost in position when out of the south a demon wind would rise up and remove the kayak from its perch. Luckily no damage was sustained but after the fourth time I just sat down in a chair in the yard. The Cobra weighs in at 80 lbs and the angles and wind and spinning and lifting wore me down. My body said no more. My mind told me this was an omen. Mother nature was telling me this trip was a no go. And so died Plan B.
I was mad. Upset. Disappointed. My wife pulled into the driveway and saw the melee in the grass. She saw the disgust in my face. I asked her to help me re-rack the kayaks in the garage and we talked about a conversation she had with my son. He really wanted to go fishing. I thought about the Leon River but the strain of the dragging and loading just deflated me. I told her I would think on it and we finished the unload. I was reading the forums looking for ideas and then a light bulb radiated in the front of my mind so bright I could have lit the block! I know a place! It would take a phone call and a little good luck but I knew a place where my son and I could both go, the wind would be an advantage and we could make a real memory or two. I made the call and it was a go. We were going to do a Father-Son outing with one of my good fishing buddies and his son. Plan C was alive and well. We all piled into my small SUV and made the hour trek to a place we call Dave's. It's a lake with a few acres, hungry bass and in a valley where the south wind is a big help in casting. We all four fished for a while and then the two boys went traipsing through the underbrush looking for grasshoppers, Devil's Claws and any other insect that could be caught. We only spent three hours at Dave's but it's some of the best time I've ever spent with my son. The time was great. Plan C worked. I learned a lesson. We ended the day with over 30 fish, a container full of finds and great times. I couldn't have asked for a better day. Sometimes, a backup plan to your backup plan is the best plan of all.